This is the introduction to “The Global Food System” a new pamphlet, which can be purchased on Amazon Kindle or on Smashwords for other formats. Causality, according to Wittgenstein, is the ultimate superstition. While he probably wasn’t thinking about the global food system when he said that, he may well have been. The story of the modern global food system is the story of unintended consequences. It’s the story of a causal logic run amok. It’s the familiar story of how we’re all intimately connected without quite grasping just how intimately. It’s the deeply disturbing story of a system characterized by historic injustice that continues to produce injustice today. It’s a story that goes to the throbbing, bleeding heart of sustainability. Finally, it’s the worldchanging story of what we do when faced with the reality of such a narrative. It can, without being hyperbolic, be called the mother of all systemic problems. I’ve been struggling, as part of my work, to figure out exactly how and why the global food system is unsustainable and to get my head around the logic of the system. This is easier said than done. This pamphlet attempts to explain how the global food system works. It does so by outlining what can be thought of as multiple “logics” that operate as part of the food system. These “logics” unfortunately operate somewhat independently from our desires, wants or even beliefs. They constitute, to borrow a phrase from Jacques Ellul, “a completely independent technical morality,” that we have to factor into our strategic responses. The intended audience for this pamphlet is anyone thinking strategically about food systems. It attempts to paint a crude but whole picture of a system that we rely on for our existence every single day. 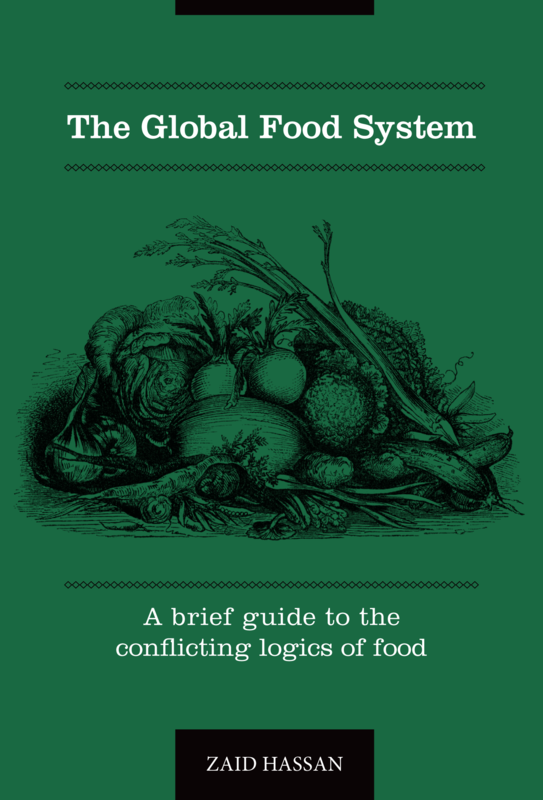 Originally consisting of three long-form essays, the intention was to put in writing a primer for starting to grasp how a system as complex as global food works. When I first started working in this space, in 2004, as part of the Sustainable Food Lab, my search for a succinct summary was laughed as by old food hands. So I tried to write one. I have updated the original essays but the conclusions drawn when I penned the originals still stand.